I have to give props to my husband for this Quinoa Pizza Casserole recipe. If you are new to my blog, my husband makes a good deal of the savory recipes. Some of his other very popular creations are the Peanut Noodle Stir Fry and the Sweet Potato Chili. I am just so much better at the desserts. 🙂 Mostly because I have always loved to bake. This Quinoa Pizza Casserole is so freaking amazing!! If you have tried and liked my Cheesy Vegan Quinoa Bites, then you must try this recipe. It’s super easy to make too! This healthy quinoa bake can stand on it’s own as a meal. I think it might also be good with a side salad or a side of roasted vegetables. It freezes well too. I was so surprised at how much it tasted like pizza!! You have got to try this one for sure. 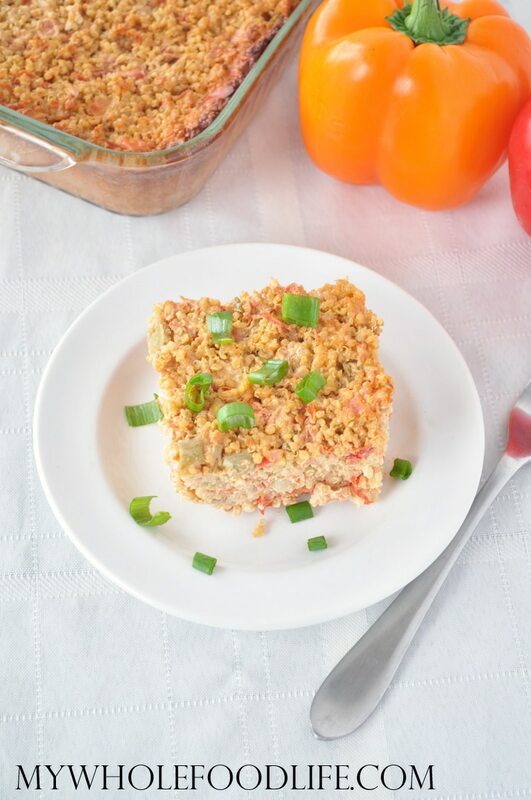 Get the taste of a pizza in this grain free casserole! Mix everything in a bowl well. Put in an 8x8 dish and bake for 1hr 15min. This should last about a week in the fridge and you can freeze it for longer. Enjoy! Thank you!! When he cooks he just adds things in. I have had to train him to measure stuff for the blog haha! I love quinoa ... and casseroles ... and definitely when they're combined together into one deliciously easy recipe! This is so great! Total props to your hubby on a phenomenal creation! Even better that it refrigerates and freezes well ... so many dinner dilemmas solved all at once! :D I'm dying to try it and can't wait to pin it to share! Thanks Shelley!! It is definitely one we will be making again! "Technically quinoa is a seed, not a grain, so this is gluten free and grain free." As a botanist I can tell you this simply isn't true. Technically grains ARE seeds. Basically, all grains are seeds, but not all seeds are grains. The part of the plant that comes into being as a result of the flower being pollenated is the seeds and it gets put in the ground to grow a new plant. Rice grains grow rice plants, corn grains grow corn plants. They are all seeds. Pine trees have seeds. Grains are a starch filled seed that we harvest and eat and they come from the Grass Family, called the Gramineae in Latin. Grasses when mature, have very tiny unusual flowers that get pollenated and create seeds. The attached article gives a very good layman's description of the differences. http://www.macrobiotic.org/health4.html Thanks for listening. I subscribe to this blog and enjoy the recipes. There is a misleading statement about grains/seeds in this issue. "Technically quinoa is a seed, not a grain, so this is gluten free and grain free." As a botanist I can tell you: ALL GRAINS ARE SEEDS, BUT NOT ALL SEEDS ARE GRAINS. Grains come from the Botanical group Grasses, also known as the graminoids. Many of the grains we eat come particularly from the family Poaceae (also called Gramineae). "Grains" are the seeds of this particular group of plants. Plants like Quinoa and Amaranth are NOT GRAINS because they are botanically different and are from a different family, but...they are also seeds. In fact, almonds, walnuts, lentils, dried beans and peas, buckwheat are among the other foods we eat that are also SEEDS. The statement made in this blog implies that grains are not seeds and that is just not correct. Thanks for listening. Thanks for clarifying. I had no idea. Printed out to make today. Sounds yummy. And easy. I love easy. I am allergic to nuts, what can I use for the cheese sauce? My oh my this looks AMAZING!!! and not at all horrifically fancy! so come on yummy pizza casserole! Looks so delish and nutrish can't wait to try it. I made this for dinner tonight. It was delicious, although I don't think mine tasted like pizza.. Thinking I might add some chopped broccoli next time.. Thank you! So glad you liked it Francine! Why both vine ripened tomatoes and baby tomatoes? Why not all one or the other? One provides a sweetness the other provides extra liquid.